Fondant snowflakes are a pretty decoration to make for holiday cakes, cookies or cupcakes and even as lovely accents for table centerpieces. This technique makes less elegant snowflakes that are perfect for rustic Christmas designs.The fondant tubes for the process are created using a decorative press set but you can also simply roll the fondant into sausage shapes using your fingertips. Decide on the type of snowflake pattern that you wish to use. The wonderful part about creating snowflakes out of fondant is that you can make different designs that reflect the fact that no two snowflakes are alike. Pre-made stencils, cutters, and snowflake patterns make this process very simple or you can create your own snowflakes. If you are using a decorative press then you should knead a little Crisco or vegetable shortening into the fondant to keep it soft. Dust a little cornstarch on your work surface before getting started so your designs do not stick. Using a rolling pin, roll out a ball of fondant into a thin sheet on a piece of parchment paper. It's best to do the remaining steps all on the parchment paper. Once the fondant dries, it will be easier to remove them from the parchment paper than other surfaces. Use a large snowflake cookie cutter to cut out one snowflake. Re-roll the leftover fondant and roll into a sheet again and cut out another snowflake. Use a straw to cut out a pattern in the snowflake. You can also use very small cookie cutters to cut out additional shapes! Use a knife to cut out more designs in the snowflake. Make them symmetrical on each side. Wet the surface of the snowflake lightly with a paint brush and then sprinkle with edible glitter or sanding sugar. Press silver dragees or edible pearls onto the snowflake. 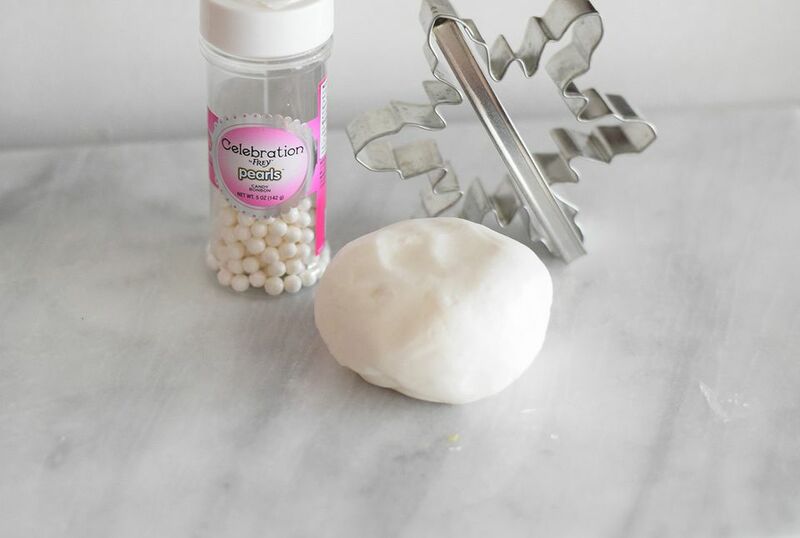 Allow the snowflakes to completely dry and transfer them to the dessert you are decorating! You can also try this alternative snowflake. Use a decorator press set with the circle insert to create long tubes of fondant. Roll a small ball of fondant and put it into the press. Squeeze press handles firmly to make the long sausage shapes and then cut them to the desired length. Dab a little water in the center of one of the cut length and press a second piece creating an ``X``. Use a ball tool to stick the two tubes more firmly together. Take a pinch of the white cake sparkles in your palm and then dust the snowflake. You can put on more than is required to ensure all the arms are sparkly and pretty. Simply blow the excess off after. For a different look, you can also mix silver luster dust and a tiny bit of vanilla extract or lemon juice together and paint it onto the snowflake for a rich sheen when dry. Use a paintbrush to dab a little water in the middle of the crossed fondant tubes and then stick another cut piece on top of the others. Use the ball tool in the middle again. Spread the arms of the pieces until they are evenly spaced. Use a paintbrush to dab water on the fondant base where you want to place the smaller pieces so they will stick. Fold the small pieces so they are in a ``V`` shape and stick one onto each of the arms of the snowflake. Try and space them close to the middle of each arm. Use the ball tool to press down in the center of each newly-attached piece. Use the decorator press to squeeze out more fondant tubes. Cut the same length as the other shorter pieces using a sharp knife.Fold the small pieces so they are in a ``V`` shape and stick one onto the ends of each of the arms of the snowflake with the "V" facing out. Use the ball tool to press down in the center of each newly-attached piece. Use the paintbrush to lightly wet the entire surface of your snowflake with water. Apply the silver dragees to each of the small indents left by the ball tool. It is often simpler to use tweezers to place the tiny balls correctly. Push the dragees gently into the fondant to ensure they stick. 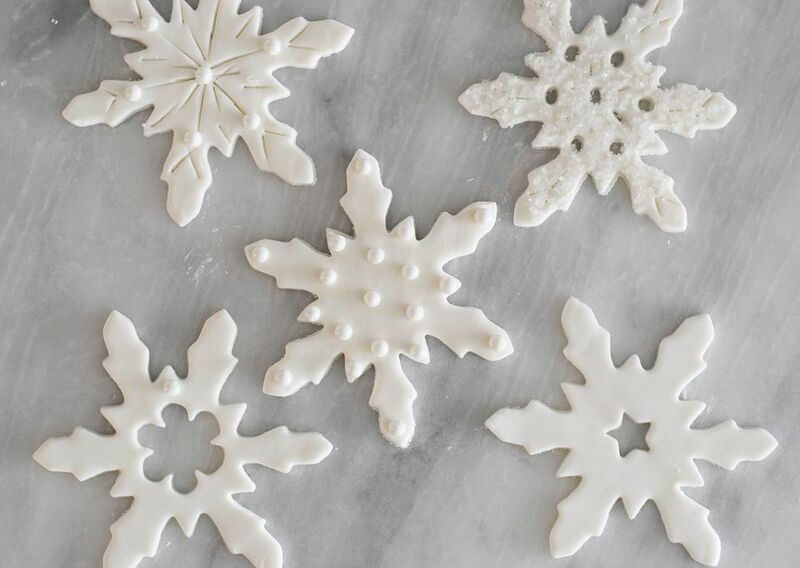 Transfer the finished snowflakes with a spatula to parchment to allow them to dry.Let the snowflakes dry out completely before using them, usually a full 24-36 hours.